An agreement between BOE and Samsung Electronicshad been circulating in the trade press, where BOE would supply TV panels to Samsung Electronics at 60% below cost while Samsung would provide information on how BOE might improve yields, particularly in its small/medium OLED manufacturing. The Chinese trade press is now stating that BOE has denied such a deal, although there has been no public statement, and that Samsung has made no contribution toward BOE’s progress on improving yields at its Gen 10.5 fab, given the fact that Samsung Display does not have expertise regarding panel production above Gen 8.5. BOE has supplied panels to Samsung Electronics in the past, and negotiations between the two companies likely continue, but it seems any admission of heavy discounting to garner favor or information, is far too onerous for any Chinese panel manufacturer to admit publicly. As noted previously, it would be heresy for Samsung Electronics to reveal any information concerning yield improvement for OLED, especially as Samsung Display would be the company with the expertise. Digitimes indicated that ‘industry sources’ are indicating June panel pricing is under pressure and is approaching cash costs for a number of panel producers. Digitimes concluded that panel producers will soon lower utilization rates, due to declining panel prices in May, even though panel producers would rather offer further discounts to attract customers than reduce utilization. Digitimes cites another drop in 32” panel prices to $50 (April’s average 32” panel price was $56 which would imply a 10.7% monthly decline) and one Taiwanese panel producer (unnamed) willing to lower their 32” panel price to $40 to secure an order of 500,000 units. Since there are only 4 Taiwanese panel producers and two of those produce under 500,000 large panel units/month, the odds are that the panel producer associated with this steep discount is either AUO or Innolux, which shows the state of desperation associated with maintaining high utilization rates, especially given that Chinese producer CSOTand Samsung Display are still offering similar panels at $48 and $45 respectively, according to the article. Digitimes comments are based on anecdotal evidence and or very specific model pricing, but the general tone seems to be that panel producers have not yet reached the pain level needed to cut production levels. Panel producers will consider lower utilization in Q318, which is typically the strongest quarter of the year for unit volumes, making such a decision far more onerous than if the decision was being made in 1Q or 2Q, The possible mitigation would be higher seasonal demand toward the holidays, keeping panel prices from falling as quickly as they have recently. Unless the holiday sell through is horrible, the supply side would tighten enough so that panel prices could begin to stabilize in 1Q 2019. The next figure shows quarterly raw capacity and ROC from 2017 through 2019, which also must be considered in understanding panel producer’s decision-making processes. As new capacity comes on line, those producers have an even stronger desire to fill these new fabs, and will consider taking deals at the break-even level in order to show that this new capacity is already being used, and while the margins on such ‘fill-the-fab’ deals might be zero or negative, that can be explained away, at least for a quarter or so, as typical losses as a new fab brings up high volume production. 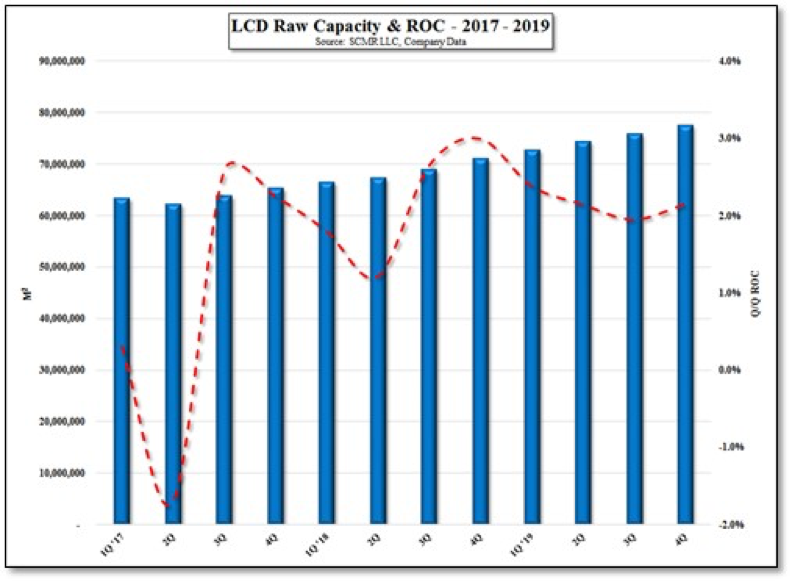 LCD panel makers will face a difficult period heading into 2019, and while trade issues, which is likely to distort the best projections.